Scientists in St. Petersburg are working on smartcar technologies that will enable vehicles to communicate amongst themselves on the roads. This “intelligent” flow of automobiles could cut city traffic by as much as 20 percent, as well as significantly reduce car accidents. At St. Petersburg’s National Research University for Information Technologies, Mechanics and Optics (ITMO), scientists recently presented technology that aims to create an “intelligent” flow of automobiles. 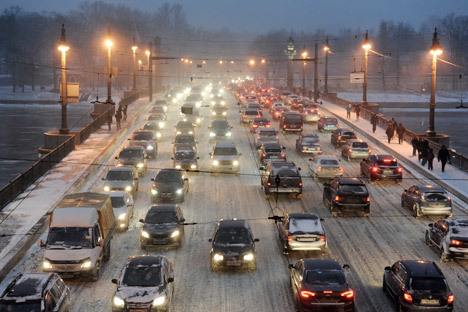 These innovative devices and software may one day reduce traffic in Russia’s Northern Capital by 20 percent and significantly reduce the number of accidents on the roads. Grigoriev believes that any Petersburg resident can imagine how these “smart” systems will work: a specific group of automobiles will be able to “chat” like a group of people sitting in the same room. In cities, the signal will travel up to a little over half a mile. The network will function reliably amongst cars traveling up to a speed of 100 miles per hour. At present, however, these devices are still being tested in Russia and are not yet available to the ordinary consumer. Interest in the technologies will likely come first from special municipal services, public transportation, traffic policemen, ambulance drivers and firefighters. “Imagine that when a bus or ambulance approaches an intersection the light changes to green. As for the algorithm of managing individual pedestrian crossings, that is a separate story. If we want to provide clear roads for public transport, ambulances and fire engines, that is another option. Everything depends on the task at hand; then we begin to create the algorithm, the necessary programs, and develop means of relaying information,” said Grigoriev. According to Grigoriev, ITMO will present this technology, which is to be developed in cooperation with Finnish scientists, as early as next year in three regions of Russia.